This tea is a step up from the straight black tea we posted about here. The pieces are more intact and show more of those prized “golden tip” buds. The Classic 58 is more varied in its flavor, too. This is another black tea from the town of Fengqing in the Yunnan Province of China, an area better known for its many pu-erh teas. (Fengqing has a long history of tea planting, production, and consuming, and is where Yunnan black tea originated.) This black tea is a far cry from the dust in a bag that many people think of when they think about having some black tea. One look at the dry leaves can show that you’re dealing with something special. Small wonder that when steeped the leaves produced a liquid with wonderful characteristics. But I’m getting a bit ahead of myself. Let’s back up and take a close look at those leaves. 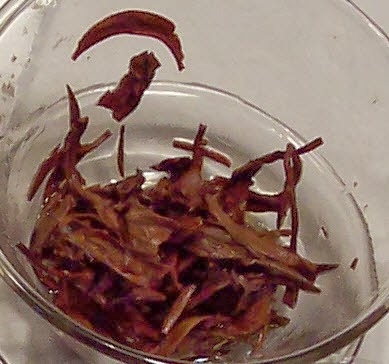 The dry leaves are larger pieces than the Fengqing straight black tea and are mostly dark brown with some tan (these are fine leaf buds, or “golden tips” and are present in teas from Fengqing more than in other Chinese black teas). They have a more fruity, planty aroma. The liquid was more rosy colored and had a lighter aroma. The flavor was complex, including asparagus, a toastiness, and a tangy aftertaste. 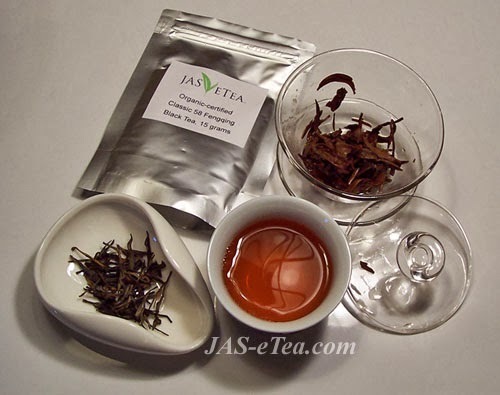 As stated in previous articles, the key with this tea is to shorten the steeping time from what you would normally do for a black tea – about 2½ or 3 minutes instead of 5 or 6 minutes so typically recommended. If you are in the habit of drinking black tea with milk and/or a sweetener, take a moment to sip this one straight first, instead of adding anything right away – you may find it is perfect as is. Also, as with other fine Fengqing and various Chinese black teas, they are perfect for infusing in small amounts, sipping, and then infusing again from the same leaves. 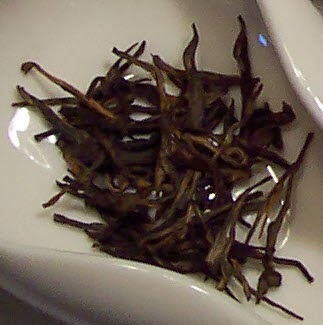 This entry was posted in Black Teas, China and tagged Black Teas, chinese tea, Fengqing, JAS-eTea. Bookmark the permalink.